We love to see new CBD companies stepping into the scene. Especially those that seem to be committed to providing the highest-quality products you can find on the market. Cannabare seems to be one of those companies. Cannabare is new to the CBD industry. Like many other new companies that exist, they realize that it’s going to take something special to stand out in an otherwise saturated industry. We knew Cannabare was different the moment we received our shipment. Cannabare is a CBD company dedicated to offering the purest CBD oil you can find. According to their website, the remarkable anti-inflammatory, neuroprotectant, and antioxidant properties of CBD make them more dedicated to distributing CBD on a global scale. One thing Cannabare makes quite clear is their commitment to quality. This is a company working directly with organic American hemp farmers to ensure that the CBD oil they offer is of the highest, purest quality you can find. Cannabare uses a supercritical CO2 extraction process to extract their phytocannabinoid-rich CBD oil after hemp has been harvested. Before their oil is sent to a third party lab for testing, it is first tested in Cannabare’s onsite analytical, microbiological, and final testing product testing labs to ensure it meets their high-quality standards. 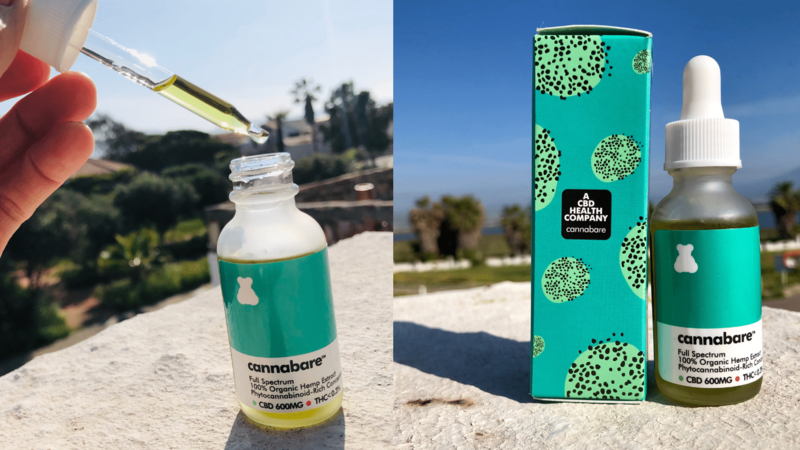 Only after every batch of raw products is sent to a third party lab to confirm their own lab results does Cannabare offer this oil to the consumer. 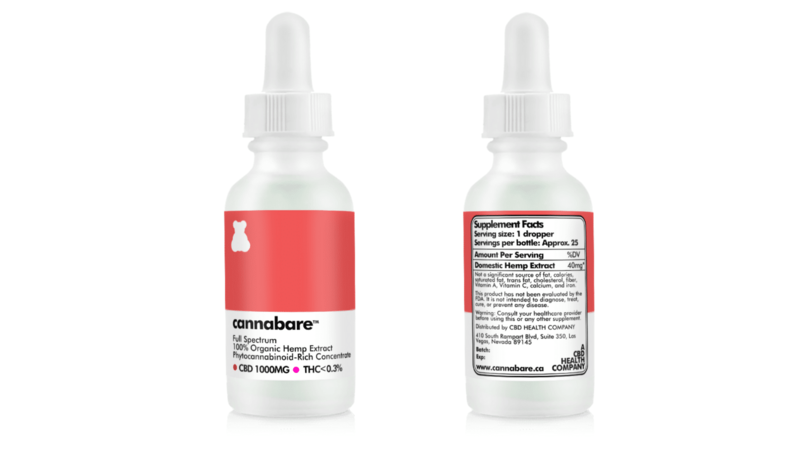 What’s more is Cannabare products all carry the Good Manufacturing Process (cGMP) seal of approval (the “c” stands for current). What exactly is cGMP? It’s a system used for ensuring products are consistently produced and controlled according to quality standards. cGMP processes are set forth by the US Food and Drug Administration (FDA) through the Federal Food, Drug, and Cosmetic Act. cGMP processes are involved in all aspects of CBD oil production, encompassing the starting materials used, equipment, facilities, and all processes. To become cGMP certified, a company must provide proof that all procedures set out by the FDA have been followed during each and every step of the process. Needless to say, companies that are cGMP certified are those that care about quality. 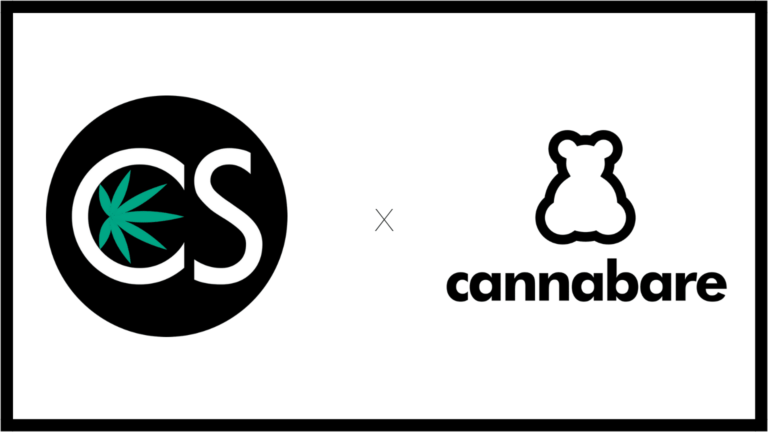 It’s only the best brands in the industry that carry cGMP certification, which is why we give kudos to Cannabare for doing this right off the bat. We love the simplicity Cannabare offers. Rather than an entire line of everything CBD, they’ve kept things simple by offering just three tinctures, available in 300mg, 600mg, and 1000mg options. 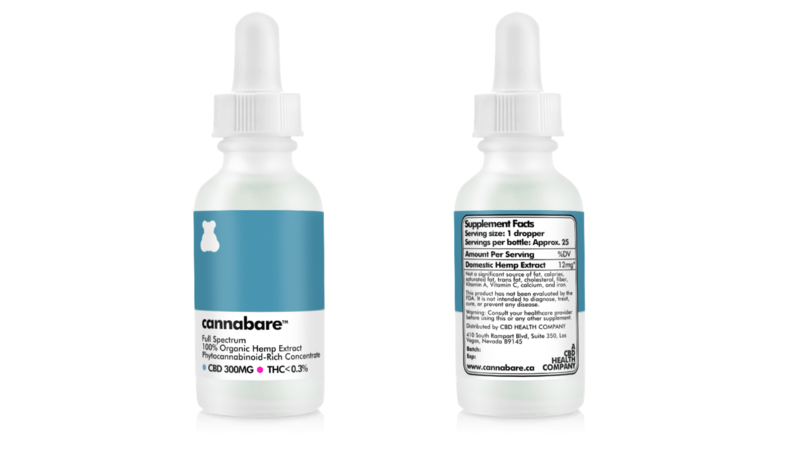 Each of Cannabare CBD Tinctures is advertised to perform differently. The 300mg CBD Tincture ($49.99) is said to “relieve stress and anxiety.” This has 12 mg of hemp extract per serving. The 600mg CBD Tincture ($99.99) is said to help you “say goodbye to pain and inflammation.” This has 24 mg of hemp extract per serving. The 1000mg CBD Tincture ($139.99) is said to help you say “hello to restful sleep.” This has 40 mg of hemp extract per serving. We like the different approach Cannabare has taken. CBD is well-documented to be beneficial for several different types of anxiety. And there is plenty of clinical and anecdotal evidence of the efficacy of CBD for pain and inflammation. To boot, more and more are becoming interested in CBD to help them get the sleep they need. Cannabare has their bases covered. How does their product stand up, though? How did we like the CBD oil itself? We mentioned earlier that we felt Cannabare was different the moment we opened our package. 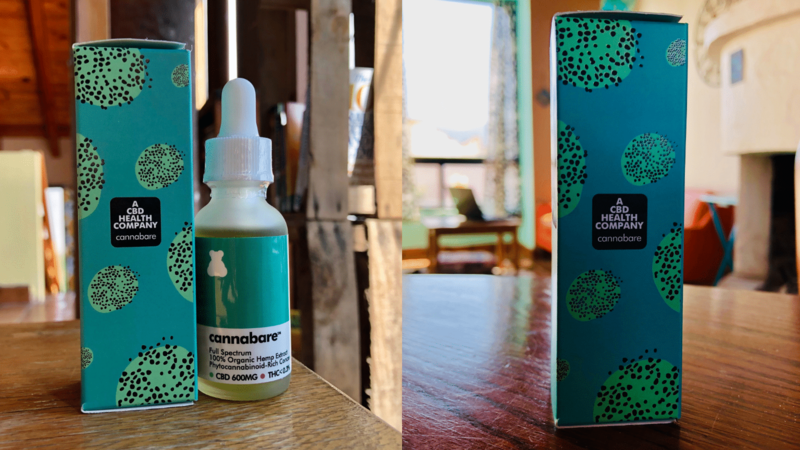 The tincture itself came in an attractive box, which is honestly something that captivates our interest. When you see as many new CBD companies as we do, it’s important that something stands out. Their packaging certainly did just that. The tincture itself comes in a clear bottle, which isn’t something we’re used to seeing. All the tinctures we’ve tried typically come in either a dark brown or blue bottle, designed to preserve the freshness and quality of the oil itself. Will the clear bottle pose a problem regarding freshness, quality, and how long the CBD oil will last? We don’t know, but we’ll ensure we’re properly storing it. We love the clear bottle and clean, crisp look of the label. We tried the 600mg option. It tasted as pure as Cannabare claims it to be. There are no added flavors or sugars or anything so what you’re getting is pure CBD oil mixed with MCT. And that’s exactly what it tastes like. There is definitely the earthy flavor you’d expect from a full-spectrum, phytocannabinoid rich, pure hemp oil. But it’s not over the top. The oil itself isn’t at all thick, and it was super smooth on the palette. If you’re someone that prefers a fruity-flavored CBD oil, this one isn’t likely for you. For those of you who prefer things to be more on the natural side of things, Cannabare has you covered. We appreciate that there isn’t any added sugar or artificial flavors. If we wanted something sweet, we’d stick to a CBD gummy. Did we “say goodbye to pain and inflammation” like Cannabare said we would? After about 30-45 minutes we did notice a difference in the neck and shoulder pain we experience on a regular basis. Anyone who sits at a computer for work everyday knows exactly what we’re talking about. The tension we regularly feel suddenly didn’t feel so intense. Could it help with other types of pain? Like in the lower back, joints, muscles, and more? Considering the well-known effects of CBD on even the most difficult to treat pain, we’re fairly confident that Cannabare CBD oil will have a similar effect. It’s no secret that we love trying out the latest CBD products to hit the market. Their clean, fresh approach to CBD is a welcomed change to many brands out there that sometimes seem they are trying a bit too hard to make it. One thing we really appreciated about this company was their dedication to helping others achieve a healthier lifestyle. Not only do they offer some of the purest CBD we’ve tried in a while, but lifestyle tips that can help you begin to improve your overall health and wellbeing. We couldn’t agree more. Many people assume CBD is an end-all, be-all to feeling their best. Yes, it helps, but it’s not a miracle. You’ve got to implement other healthy changes in your life to truly experience just how well CBD really can work. This is when you begin to experience the miraculous. Cannabare suggests that aside from CBD, that people begin to implement things like meditation, exercise, organic foods, going fluoride-free, and daily journaling. Perhaps we resonated with Cannabare so much because these are all things we do on a regular basis. We know CBD alone is awesome. But know firsthand just how amazing it can be when you’re living an already healthy and balanced lifestyle. CBD simply makes life that much better. We really appreciate that this is something Cannabare mentioned. Too many companies out there hype up CBD as the one thing that will change your life. It can. But you’ve also got to be the change you wish to see. 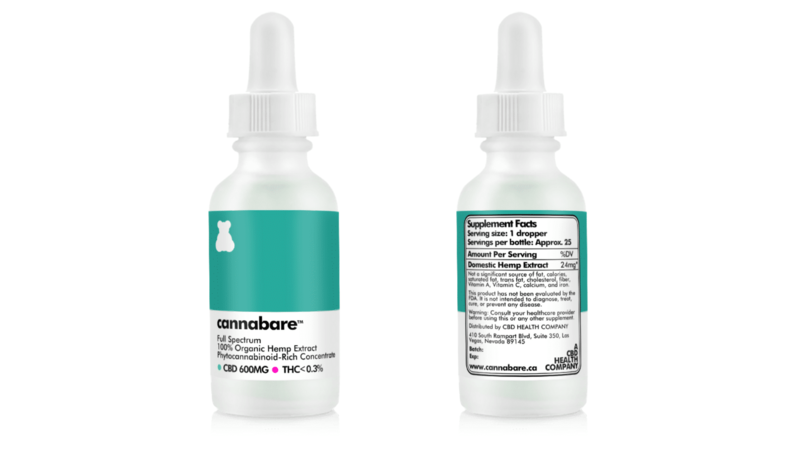 Will we continue using Cannabare CBD Oil Tinctures? If you’ve tried Cannabare yourself, we’d love to hear about your experience in the comments below. Click here to try Cannabare CBD for yourself today!